A private college located in south-central Iowa is pledging to cover the first year of tuition for dozens of students from low-income Iowa families. Simpson College President Jay Simmons unveiled the “Simpson Promise” initiative today at a news conference on the Indianola campus. Students who graduate from an Iowa high school and whose families have an adjusted gross income of $60,000 or less will be eligible for the program. 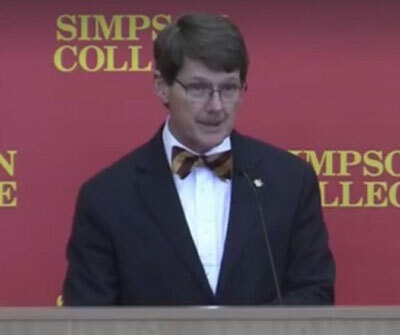 “Simpson College will provide the cost of their tuition, free of charge to that family, for their first year of attendance at the institution,” Simmons said. There are just under 1,300 full-time students at Simpson College this year. Simmons expects 25-to-40-percent of future incoming classes will qualify for the offer of free tuition. “In absolute numbers, that would be somewhere in the order of 100 to 150 students in some years who would be able to take advantage of this opportunity,” Simmons said. Tuition at Simpson this year is $38,412. School officials note, however, that all Simpson students receive at least some financial assistance regardless of their family income.